Cookies | TastingSpoons | Page ? Posted in Cookies, on March 3rd, 2017. You might think that all I eat is baked goods. A friend who looked at my blog recently thought that, but then, she didn’t delve very deeply into my posts. I probably have more desserts and cookies than any of the other categories. I just enjoy baking a lot. I have no cookies in my house at the moment. Needing some cookies and things for an event recently, I looked at some newer recipes I’d added to my to-try list. 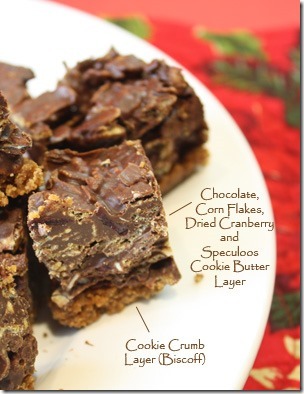 This recipe came from Peabody, at SweetReciPEAS. She raved about them, so that was a good enough excuse to bake them for my event. They’re two layers – a brown sugar and butter base (with flour and egg), then you press walnuts into that layer; then you mix up the brown sugar meringue mixture and spread it on top. Bake. See? Easy. She used bourbon in the base and in the meringue topping too (though you can use vanilla instead). Truly, I couldn’t taste the bourbon, but perhaps if they’d been omitted, they’d have been less flavorful – won’t know unless I try them side by side. Out of the entire 9×13 pan batch, I ate one and either served them at my event or gave them away to friends. I thought they might not keep all that long anyway. They’re delicious. A bit of crunch from the bottom layer and a light crunch from the meringue. Plus the walnuts in there too. The meringue doesn’t exactly stick very well to the base, so be careful as you cut them up. Perhaps a whipped up raw egg in between might solve that problem, if you’re inclined to try it. What’s GOOD: the flavor and crunch. They’re sweet – very sweet. If I make them again I’ll cut down on the sugar in both layers by just a tetch, but everyone I served them to raved about them. They almost have the sweetness of candy, but they’re definitely NOT candy. You could cut larger pieces, serve with whipped cream as a dessert portion. I made bars and got about 18 or so from the pan. Very different – the meringue has a golden hue – almost like taupe, from the brown sugar. Kind of different. Not everyone recognized that it was a meringue top. What’s NOT: really, nothing. These are delicious. Easy to make. 1. Preheat oven to 350 F. 2. Spray a 9-x-13-inch baking pan with baking spray. Set aside. 2. BASE: Add the flour, baking powder, salt & brown sugar in the bowl of a food processor fitted with a metal blade. Pulse until the ingredients come together. Add the butter and process until the butter is the size of small peas. Add the egg yolk and bourbon and pulse until the mixture as the consistency of sandy clumps. Pat mixture into the pan and level off by pressing with a small offset spatula or spoon. 3. Top with walnuts. Push them into the dough. The dough is crumbly so it will need to be patted down again. 4. MERINGUE: Using a stand mixer fitted with a whisk attachment beat egg whites until they hold a peak when whisk is lifted. Add the brown sugar and beat at the highest speed about 4 minutes. Add the bourbon and beat for another minute. Spread the meringue over the walnut layer. The meringue does stick to the dough, sort of – the dough is sandy, so it’s not easy to spread. Just do you best you can. Bake 25 minutes or until tester inserted into pan comes out clean. 5. 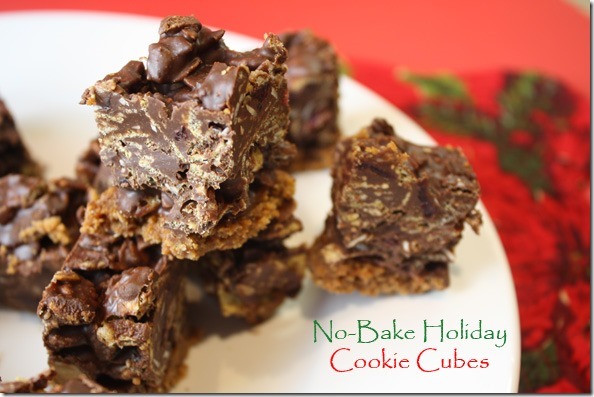 Let cool to room temperature and cut into squares. Per Serving: 221 Calories; 12g Fat (47.2% calories from fat); 4g Protein; 25g Carbohydrate; 1g Dietary Fiber; 37mg Cholesterol; 114mg Sodium. Posted in Cookies, on January 12th, 2017. These were cookies my friend Cherrie made the day we did a marathon Christmas cookie bake day. We only did 4 types of cookies last month – usually we do 5-6, but whew, that’s just too much. Cherrie found this recipe at King Arthur Flour, and she was intrigued because of the lemon. 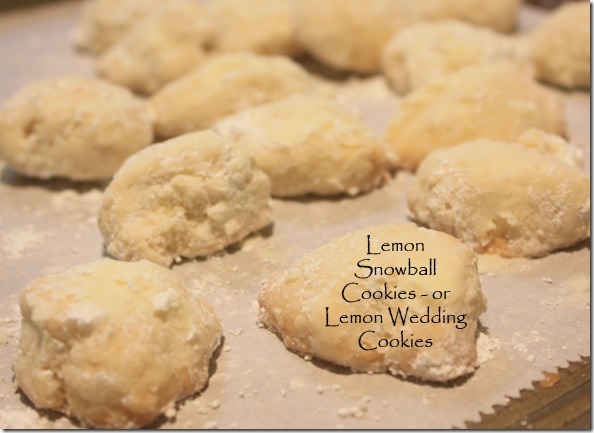 We always make the Mexican Wedding cookies (same type, without lemon), but the lemon part added a really lovely flavor. Ours (hers – I was making a different cookie a few feet away but watched her) didn’t come out as round as the unflavored ones, but surely it doesn’t matter. The recipe online calls for an ingredient we didn’t have – lemon juice powder. It sounds wonderful – a way to add concentrated lemon flavor without having to juice lemons. It is a sweetened product (with corn syrup) but it’s dry – a powder. You don’t use very much of it, so I may order it next time. We did without it. Am certain our cookies weren’t quite a lemony as the ones made with the powder added, but they’re pretty darned good the way they are. These are simple to mix up – ample butter, of course, no eggs, but powdered sugar inside and outside. The lemon juice powder is combined with the powdered sugar for the coating (if you use it). They’re baked and are just a one-bite wonder. Delicious. The recipe indicated it made 50-60. Uh . . . no, it made about 32, so next time we’d definitely double the recipe. In fact, I think when I finish the recipe, I’ll double it for you – because 32 cookies definitely aren’t enough! What’s GOOD: the lovely, but subtle lemon flavor. Love the texture of these anyway – light, crumbly and just one bite. Definitely a keeper. They’re small. What’s NOT: rolling these in powdered sugar is a bit of a pain, but it doesn’t take all that long. Worth making anyway. 2. In a medium-sized bowl, beat together the butter and salt until soft and fluffy. 3. Mix in the confectioners’ or glazing sugar, and lemon oil or grated rind (zest). 4. Add the flour, mixing until well combined. 5. 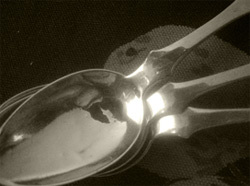 Form the dough into 1″ balls; a teaspoon cookie scoop is a real time-saver, and your cookies will be nice and uniform. Place the balls on an ungreased baking sheet. 6. Bake the cookies for 12 to 15 minutes. They should be very light brown on the bottom, and feel set on top. 7. Remove the cookies from the oven. Let them cool on the baking sheets for 3 minutes before disturbing; they’re very fragile when hot. 8. To finish the cookies: Sift the confectioners’ or glazing sugar with the lemon powder and place in a shallow pan. Roll the warm cookies in the sugar/lemon coating. 9. Let the cookies cool completely, then add edible glitter (if desired) to the coating and re-roll in the sugar. When completely cool, store cookies in airtight containers for 1 week, or freeze for longer storage. Per Serving: 116 Calories; 6g Fat (44.8% calories from fat); 1g Protein; 15g Carbohydrate; trace Dietary Fiber; 16mg Cholesterol; 18mg Sodium. Posted in Cookies, Desserts, on December 19th, 2016. 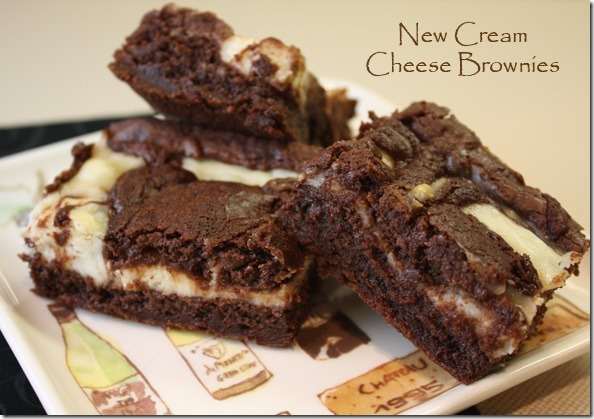 Did you know there’s a somewhat different way to make cream cheese brownies? Neither did I, but they’re really, really good. Yes, better than the old recipe. 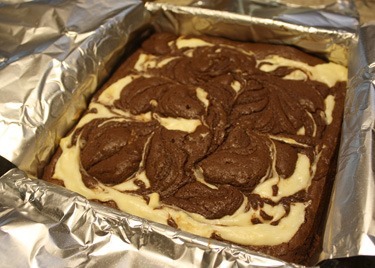 I’ve long been a fan of cream cheese brownies. Not that I make them all that often – it’s been a couple of years. But I watched a show on America’s Test Kitchen awhile back and they talked about some of the inherent problems that existed with the old-style ones. What’s new about these: (1) unsweetened chocolate provides a more bold chocolate flavor; (2) sour cream added some tang to the cream cheese layer; (3) a more cakey batter doesn’t allow the brownies to get soggy or dense; (4) no more dry edges because the cream cheese layer is spread all over the chocolate batter, then a reserved portion of chocolate is dolloped on top before the whole pan is swirled and baked. The chefs at ATK felt that the two batters didn’t complement one another, so they set out making a bunch of changes. And it works. No question about that. I’ll be making these again and again. They also recommend preparing heavy-duty foil slings (both directions) in and out of the 8×8 pan. See photo above. You prepare a chocolate batter. You make a cream cheese, sour cream, sugar and flour (very little) mixture that comprises the cream cheese layer, so to speak. There on the right you can see the chocolate batter which was poured into the pan first. About 1/2 cup was reserved and set aside to dollop on top later. 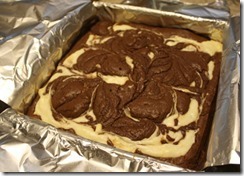 At left, see how you gently spread the cream cheese layer on top of the chocolate batter. You spread it almost out to the edges. THEN, you use that reserved chocolate batter (that needs to be heated in the microwave for 10-20 seconds to heat it up and make it more liquid) and you either pour or scoop it all over and around the top. Then you use a regular knife to swirl it – they tell you to do about 10-12 strokes. I did a zigzag pattern , going one way, then the other. I ended up with the photo at right of the finished pan. The brownies are baked at 325°F. for about 35-40 minutes. Mine took the full 40 minutes and you need to stick your cake tester or toothpick into the chocolate portion, not the cream cheese part (it’s still retains a bit of a soft texture). 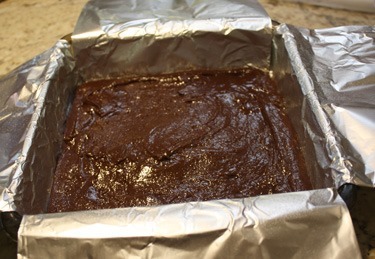 Once baked, you leave the brownies in the pan (in the slings) for an hour before removing them. If you do it too soon they won’t remain flat and stable (solid) on the bottom and the whole pan full would bend with the sling. I removed them after an hour or so, laid the foil edges over the top and let it sit overnight. They were still warm when I went to bed, so I left them out. They recommend you keep these refrigerated (because of the sour cream), but I think I’d let them come to room temp before serving. What’s GOOD: these cream cheese brownies are really wonderful. I loved the more intense chocolate flavor. The cream cheese layer was a bit more stable (with the added flour) so the brownies weren’t dense at all, more cakey altogether. Loved these. As I mentioned, this is going to replace my old recipe, and yes, I’ll be making them again. What’s NOT: nothing really. The foil slings take a bit of fussing with, to get them right, but they’re not difficult. 1. FOR THE CREAM CHEESE FILLING: Microwave cream cheese until soft, 20 to 30 seconds. Add sour cream, sugar, and flour and whisk to combine. Set aside. 2. Adjust oven rack to middle position and heat oven to 325 degrees. 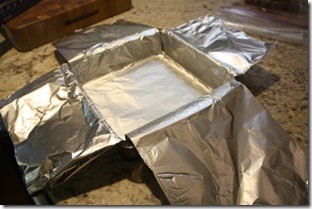 Make foil sling for 8-inch square baking pan by folding 2 long sheets of aluminum foil so each is 8 inches wide. 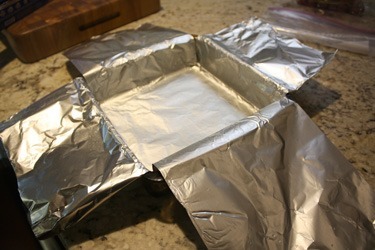 Lay sheets of foil in pan perpendicular to each other, with extra foil hanging over edges of pan. Push foil into corners and up sides of pan, smoothing foil flush to pan. Grease foil. 3. FOR THE BROWNIE BATTER: Whisk flour, baking powder, and salt together in bowl and set aside. Microwave chocolate and butter in bowl at 50 percent power, stirring occasionally, until melted, 1 to 2 minutes. 4. Whisk sugar, eggs, and vanilla together in medium bowl. Add melted chocolate mixture (do not clean bowl) and whisk until incorporated. Add flour mixture and fold to combine. 5. Transfer 1/2 cup batter to bowl used to melt chocolate. Spread remaining batter in prepared pan. Spread cream cheese filling evenly over batter. 6. Microwave bowl of reserved batter until warm and pourable, 10 to 20 seconds. Using spoon, dollop softened batter over cream cheese filling, 6 to 8 dollops. Using knife, swirl batter through cream cheese filling, making marbled pattern, 10 to 12 strokes, leaving 1/2-inch border around edges. 7. Bake until toothpick inserted in center comes out with few moist crumbs attached, 35 to 40 minutes, rotating pan halfway through baking. Let cool in pan on wire rack for 1 hour. 8. 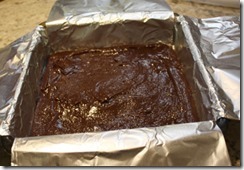 Using foil overhang, lift brownies out of pan. Return brownies to wire rack and let cool completely, about 1 hour. Cut into 2-inch squares and serve. Per Serving : 225 Calories; 14g Fat (54.3% calories from fat); 3g Protein; 24g Carbohydrate; 1g Dietary Fiber; 53mg Cholesterol; 117mg Sodium. Posted in Cookies, on November 13th, 2016. Oh, goodness gracious! Trust me, you’ve GOT to try these cookies. If you love chocolate, this is a winner. If you like dried cherries, this is a winner. The combination makes it a double winner! There is nothing all that unusual – other than some almond flour (I used the type carried at Trader Joe’s – it’s shelf stable and doesn’t get stale). It’s mixed with some AP flour, and baking soda, plus some powdered cocoa – my go-to type usually is Hershey’s Special Dark. I do have other cocoa on my shelves, but for a cookie, that type was just fine. Butter, brown sugar and white sugar are mixed up thoroughly (with salt and vanilla), then you add in the flour/cocoa mixture, and lastly, some chopped up dark chocolate and chopped dried cherries are mixed in briefly. The dough is refrigerated for a bit (I only had time to chill it for about 35-40 minutes), then you scoop (cookie scoop) a small ball of it, roll it in your palms, then roll it in granulated sugar. Onto parchment (or Silpat) lined baking sheets they go and baked for 12-14 minutes (mine took 13) at 325°F. They are VERY tender – they must cool on the cookie sheet, and then onto racks (on the parchment still) until fully cooled. I cheated and removed half of them from the parchment (so I wouldn’t have to use yet another sheet of parchment for that 3rd and final sheet tray) onto racks. A few cookies didn’t make it to the rack because they’re just so fragile until they’re fully cool. Just so you know. Lesson learned! I’ve left the metric measurements in the recipe below because I think, in this recipe, the weight of the almond flour is important, not just the volume. What’s GOOD: everything luscious little thing – the soft texture, the good dark chocolate, the little bits of chopped dried cherries and the unctuous mouth-flavor. Altogether wonderful in my book. What’s NOT: nothing at all. Easy to mix up, chill a bit, relatively easy to roll and cover in granulated sugar. Bake. 1-2-3, done. I’m sure you’ll hear some mmmmms and ahssss. 1. Whisk together the almond flour, all-purpose flour, cocoa powder and baking soda. 2. Using a stand mixer fitted with a paddle attachment, cream the butter on medium speed until light and fluffy, scraping down the sides of the bowl with a spatula once. 3. Add both sugars, the salt and vanilla extract and beat for 2 minutes more. Turn off the mixer and scrape down the sides of the bowl. Add the dry ingredients, drape a kitchen towel over the mixer and pulse at low speed for 1 to 2 seconds, about 5 times. Remove the towel and keep beating at low speed for about 10 seconds more, until everything is just combined. Scrape down the bowl again. 4. 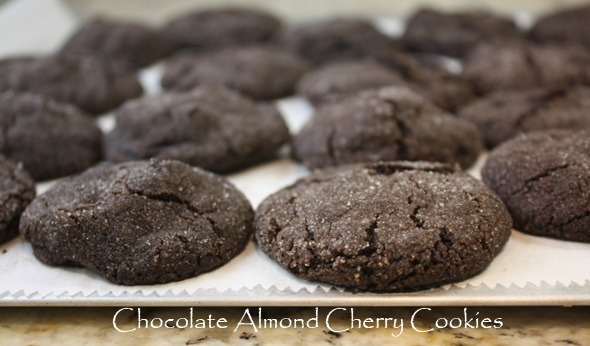 Add the chopped chocolate and dried cherries and mix on low speed for another 5 seconds or so, just to incorporate. Transfer the dough to an airtight container and refrigerate for 30 to 60 minutes. 5. Center a rack in the oven and heat it to 325 °F. Line two baking sheets with parchment or silicone mats. Pour about 1/2 cup sugar onto a large plate. Using your hands, form the dough into balls about an inch and a half in diameter. 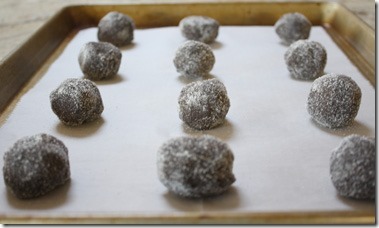 Roll the balls in the sugar and arrange them on the baking sheets, at least 2 inches apart. 6. Bake the cookies for 12 to 14 minutes; they should dome slightly in the middle, and they should look dry on the surface but still be soft to the touch. Cool the cookies on the baking sheets on racks for 5 minutes, then transfer the parchment to the racks to finish cooling. Per Serving: 97 Calories; 6g Fat (54.8% calories from fat); 2g Protein; 10g Carbohydrate; 1g Dietary Fiber; 9mg Cholesterol; 86mg Sodium. Posted in Cookies, on October 22nd, 2016. The cutest, tastiest little buggers. Easy peasy to make. As I mentioned a few days ago, my friend Cherrie and on a quest to make some different cookies for our annual cookie marathon we usually do in early December. This was a recipe I’d cut out of the Los Angeles Times – I had an old, yellowed clipping. It did require a trip to the grocery store for vanilla wafers; not something I stock in my pantry! I learned something on the journey . . . the recipe called for 12 ounces (a box) of the cookies. Those boxes are now 11 ounces, not 12. Lots of foods are now packaged in smaller quantities – I suppose it’s to avoid having to raise prices. I haven’t altered the recipe because of the loss of one ounce – they seemed to turn out okay. I wasn’t going to buy another box, and I assumed the cookie would survive that minor change. Anyway, the ingredients are all whizzed up in the food processor – the cookies, Dutch processed cocoa (I used King Arthur’s Double Dutch Dark Cocoa) pecans, dark corn syrup, and the Port wine. 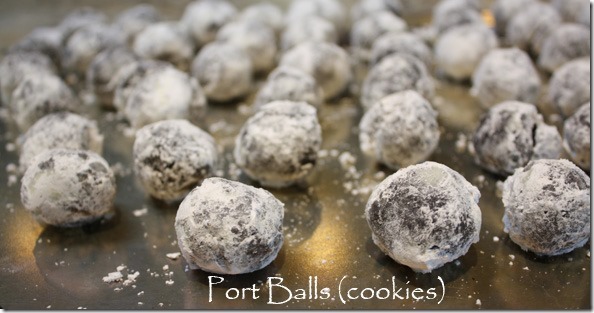 The powdered sugar is used to coat the balls after you make them. I think Cherrie counted them – we got 47 balls. THAT would account for lack of the extra ounce of cookies. The balls are small – they’re rich – and when you taste them it takes just a few seconds to feel the warmth from the wine. The original recipe called for Zinfandel Port. I’m sure at one time I had a bottle of that, but it’s been drunk in the past. I wasn’t about to make a trip to the wine store for that, so I substituted an aged Port instead. Do NOT use California Port – it’s a far cry and a poor substitute for a real, Portuguese Port. Many years ago I visited Portugal and learned to savor the many types of Port. If you visit Porto, the northern Portuguese port, you’ll likely visit the port lodges that sit right on the wharves on the south side of the Duoro River as it moseys out into the Atlantic Ocean. You’re in for a treat if you ever go there. On the same trip I also visited Madeira (it belongs to Portugal, but it’s located off the northwestern coast of Africa) and came to REALLY appreciate Madeira. I prefer it to Port any day, but Port was what was called for here, so I used some Taylor Fladgate aged Port for it. Cherrie rolled these little guys into balls, dipped them in the powdered sugar and set them on a rack to “dry” and then we packaged them up. We both really liked them. I’d definitely make these again. An adult cookie, I suppose, but there’s not much Port in them, so even if a teenager or younger child ate one, I doubt they’d notice anything except the warmth in the tummy. What’s GOOD: the overall flavor is very nice. The Port is subtle; so is the chocolate, actually. Maybe as they sit and “age” the flavors will be more pronounced. They won’t last that long, I don’t believe! They shouldn’t be frozen as the powdered sugar would disappear – though I suppose you could re-sugar them if you did. What’s NOT: well, I suppose it’s not a very good family cookie. I’m not certain children would really like it anyway. I don’t know . . .
NOTES: Original recipe called for Zinfandel Port. That may be hard to find, so use any other good quality, but heavy-duty port wine. Do not use California Port. Original recipe also called for 12 ounces of vanilla wafers, but current boxes contain 11 ounces. Recipe seems fine with that quantity. 1. In a food processor, whirl vanilla wafers until they are fine crumbs, then add cocoa powder and pecans until the mixture is uniformly fine. Add corn syrup and port and whirl until blended. 2. 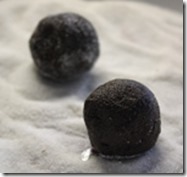 Shape dough into 1-inch balls and roll in powdered sugar. Set on a rack to dry. Transfer to an airtight container. Will keep for a couple of weeks. Do not freeze. Per Serving: 62 Calories; 3g Fat (42.9% calories from fat); 1g Protein; 8g Carbohydrate; trace Dietary Fiber; 0mg Cholesterol; 23mg Sodium. Posted in Cookies, on October 17th, 2016. Planning ahead for Christmas cookies . . .
It’s only October, and my friend Cherrie and I are wanting to make some different cookies this year when we do our annual Christmas cookie baking, usually in early December. We’ve been stuck in a rut for some years, making the same ones year after year. With all of the recipe sorting I’ve done in the last couple of months, I came across a bunch – really a lot – of old time cookie recipes that sounded good. We started with a list of 9 cookies, and narrowed it down to four. So, one day, when it was still hot, summery and sticky outside, I cranked down the A/C and we dug in to try these new recipes. We made some gingerbread madeleines. Well, they were a complete bust, pictured there at left. They: (1) were too sweet; (2) stuck to my supposedly nonstick madeleine pan; the batter was so firm after being refrigerated, per the directions, that I had to leave it out for an hour so I could even scoop it; and lastly (4) because they stuck to the pan, I couldn’t frost the correct (ridged) side as they were all pock-marked. Toss out that recipe for sure. 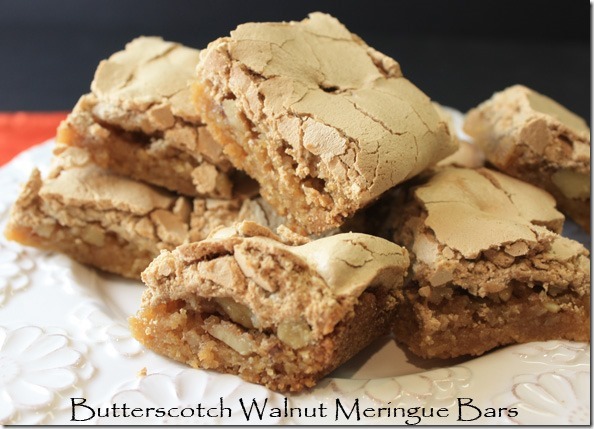 We also made a batch of lemon walnut bars. It sounded so good – Cherrie and I both like walnuts and I still have lemons on my tree. BUT, they were also a bust. 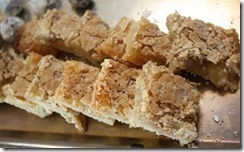 Pictured at right, they (1) were too gooey and even after baking longer and longer, the filling never really firmed up; so (2) were almost impossible to cut; and (3) because the filling was too wet/damp, the shortbread part on the bottom got soggy, which made them unstable to be a bar. They were also sweeter than I like for a cookie, too. Threw that recipe out too. Cherrie and I decided that there are so many cookie recipes out there, it’s simply not worth our time to try to figure out how to fix these. But these Amaretto bars with chocolate were great. After baking them, though, I almost thought they were going to be a bust too because we couldn’t cut them very well. I refrigerated them overnight and was able to cut them properly then, so I fixed the below recipe to make sure that problem doesn’t happen to you. The taste, though, is wonderful, but they’re RICH. Just so you know . . . The bars are layered. 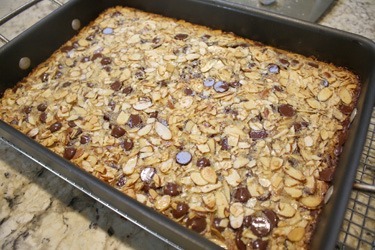 First there’s a shortbread layer on the bottom that’s baked; a filling contains eggs, chocolate chips, Amaretto, sliced almonds, sugar and corn syrup, butter and cornstarch. That’s poured over the hot bottom crust (see photo at left of the filling poured in and ready to be baked) and baked for 25 minutes. The pan is cooled on a rack, then you drop 1/3 cup of chocolate chips into a heavy-duty (freezer) plastic bag, microwave it until it’s very warm and melted, then you snip off a corner of the bag and drizzle that all over the bars. Here, on the right you can see the finished pan full out of the oven. The top is golden brown. It took a good long while for this pan to cool off – at least two hours. Do more-or-less cut the bars while the pan is warm (but not when they’re hot). The bars are ooey-gooey, but you’ll be glad to have an idea about cutting them the next morning when you can cut them completely. When chilled, the bottom shortbread is very firm, so I was glad that most of the bars were already mostly cut. What’s GOOD: did I mention that they’re very rich? Yes, indeed, so do cut them into small squares. I’m not sure how many I got from the pan, so I guessed at 36. You might get more than that. Being so rich, you won’t want to eat more than one, most likely. If you’re a chocoholic, you’ll be a happy camper. If you prefer milk chocolate, just substitute for the dark listed in the recipe below. Great recipe. What’s NOT: nothing about them is hard to do, and it makes a lot of cookies/bars, but it’s a bit fussy trying to get them cut properly. I thought it was worth the effort, but for some, you might find it a bit difficult. I advise using a glass 9×13 pan so when you use a sharp knife to cut, you won’t be damaging the knife on the metal pan. I used my nonstick pan, and won’t do THAT again. I’m surprised I didn’t make some permanent grooves in the nonstick coating. 1. PREHEAT oven to 350º F. Grease a 13 x 9-inch glass baking pan. 2. FOR CRUST: Beat flour, butter and brown sugar in large mixer bowl until crumbly. 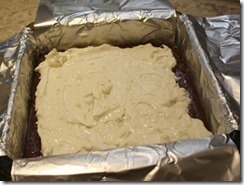 Press into prepared baking pan. 3. BAKE for 12 to 15 minutes or until golden brown. 4. FILLING: Beat eggs, corn syrup, granulated sugar, butter, cornstarch and liqueur in medium bowl with wire whisk. Stir in almonds and 1 2/3 cups morsels. Pour over hot crust; spread evenly. 5. BAKE for 25 to 30 minutes or until center is set. Cool completely in pan on wire rack. 6. DRIZZLE: Place remaining 1/3 cup morsels in heavy-duty plastic bag. Microwave on HIGH (100%) power for 30 to 45 seconds; knead. Microwave at 10- to 15-second intervals, kneading until smooth (this may take 90 seconds or so to reach the melting point, but not hot enough to melt the plastic. Cut tiny corner from bag; squeeze to drizzle over bars. Using a knife, and with a tall mug of boiling water nearby, cut the bars into 1 to 1 1/2″ squares, dipping the knife back into the hot water if the filling sticks. Try using a sharp spatula to cut through the crust part. Refrigerate for several hours. Using a spatula or a kitchen knife or both, re-cut the scored part and carefully lift out the squares. If storing for awhile, put waxed paper between layers and seal in a plastic box for up to a week. Keep bars in refrigerator. Per Serving: 228 Calories; 13g Fat (49.0% calories from fat); 4g Protein; 27g Carbohydrate; 1g Dietary Fiber; 36mg Cholesterol; 65mg Sodium. Posted in Cookies, on July 27th, 2016. Why would I bake yet another cookie of the chocolate chip variety? 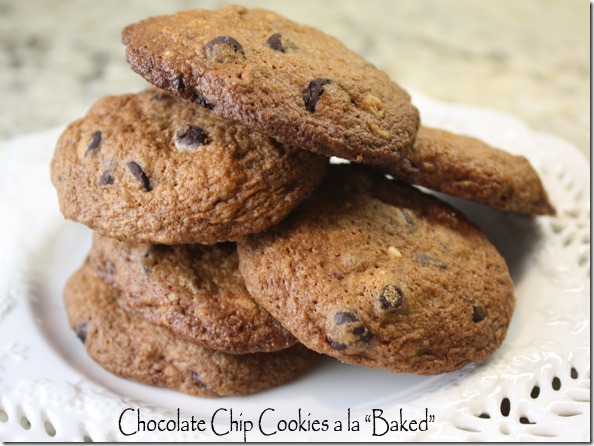 I have nothing fewer, to date, than 20 similar recipes – on my index here on my blog, I have a category on the cookie page just for chocolate chip cookies. Why would I do it? Well, it was the rhetoric that accompanied the recipe – that it had become the best chocolate chip cookie in her collection. Or something like – this is my go-to cc cookie. That kind of language perks my ears, piques my interest. It made me save the recipe, and ultimately, to make them. And I must admit, these cookies are downright fabulous. I prefer crispy chocolate chip cookies, and these definitely fit my mold, satisfying my craving for a crispy cookie. My first pans full I over baked them – the photo above. They were almost burned because I forgot to set the timer once I switched the pans around half way through. Suddenly I began to smell something hot – yep, these cookies. But oh gosh – they were so good! The next batches I was more careful and removed them after 14 minutes. They were perfectly golden on the outside but still slightly soft in the middle. Below is a photo of the cookies done at exactly 14 minutes. To adhere to the recipe instructions, these are still over-baked as she recommends taking them out when the edges are just golden. So if you make them you can decide for yourself. 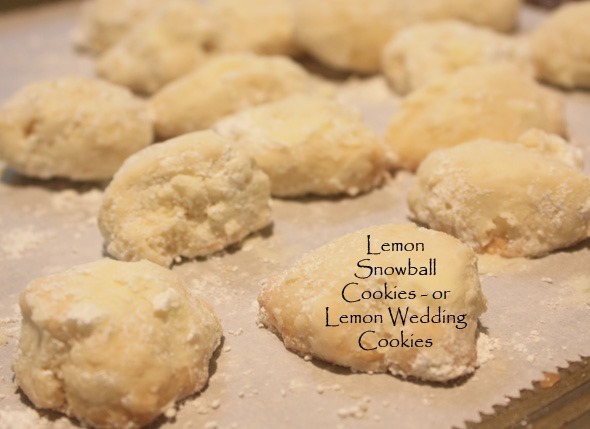 This recipe is much like most cc cookie recipes – I looked at this one side-by-side with my other favorite, the ones from Silver Moon bakery, and the ingredient list is nearly identical, with this one containing slightly less butter and a little less flour. About the same on everything else. These taste sweeter. Don’t know why. The batter is very sticky – the difference being the amount of flour as mentioned, I suppose. Hence the chilling time is necessary to make the dough manageable (to roll balls in your hands). Next time I make these I’ll use a little less sugar and see if I like them even better. I got the recipe from CakeSpy (a blog). 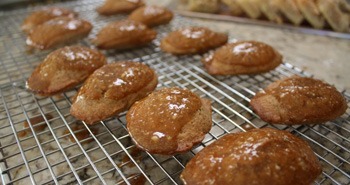 When she made these, she got the recipe from Baked: New Frontiers in Baking (cookbook) by Matt Lewis. 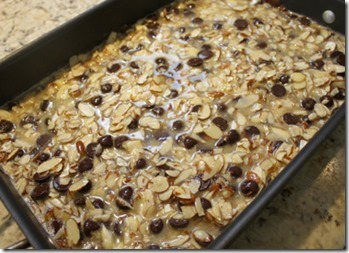 CakeSpy changed the recipe only slightly to add walnuts and reduce the amount of chocolate chips by that amount. I always like cc cookies with both chips and walnuts, so I chose to use her variation on the cookbook recipe. I sent some home with granddaughter Taylor and her friends as they headed back to NoCal. What’s GOOD: has this moved into #1 position in my ranking? Hmmm. Not sure. They’re awfully good, but I still think Silver Moon ones are my favorites. I’ll have to make a decision, I guess, in a few days about the ranking! I freeze my cc cookies, and I eat them frozen, so that will be my final test, eating the hard, frozen cookie. I must say, however, that his cookie was oh-so good, still slightly warm with a cold glass of milk. Yum. What’s NOT: only that the batter has to chill for several hours. Not sure why, but it’s in the recipe. Maybe it helps them keep their shape better since they start out cold on the baking sheet. Fabulous cookies – can’t complain about anything! 1. In a large bowl, whisk the flour, salt, and baking soda together; set aside. 2. In the bowl of an electric mixer fitted with the paddle attachment, beat the butter and sugars together until smooth and creamy. Scrape down bowl and add eggs, one at a time, beating until incorporated. Mixture will look light and fluffy. Add vanilla and beat for 5 seconds. 3. Add the flour mixture, bit by bit, mixing after each addition. 4. Using a spatula or wooden spoon, fold in the chocolate chips and walnuts. 5. Cover the bowl tightly and put in the fridge for several hours. 7. 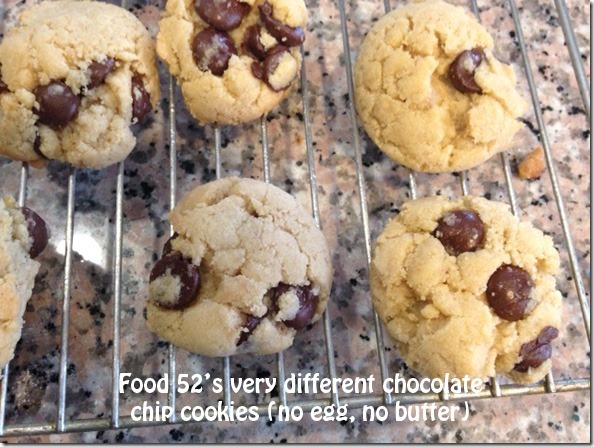 You can bake larger cookies (2 tablespoons each) or smaller (2 teaspoons each). Use your hands to shape into perfect balls and erase any imperfections. Place on prepared baking sheets, leaving at least an inch between cookies. 8. Bake for 10-12 minutes for smaller cookies, 12-14 minutes for larger cookies. Rotate pans halfway through to ensure even baking. They’re done when the edges are golden and the tops are just starting to lose their shine. 9. Remove pan from oven and cool on wire rack. They are great warm, but you could also let them cool, if you’re so inclined. 10. These can be stored in an airtight container for up to 3 days or freeze for longer storage. Per Serving: 168 Calories; 10g Fat (49.0% calories from fat); 2g Protein; 20g Carbohydrate; 1g Dietary Fiber; 26mg Cholesterol; 102mg Sodium. Posted in Cookies, on February 24th, 2016. Okay, listen up my friends. If you’ve learned to trust me when I tell you – these cookies are beyond wonderful. 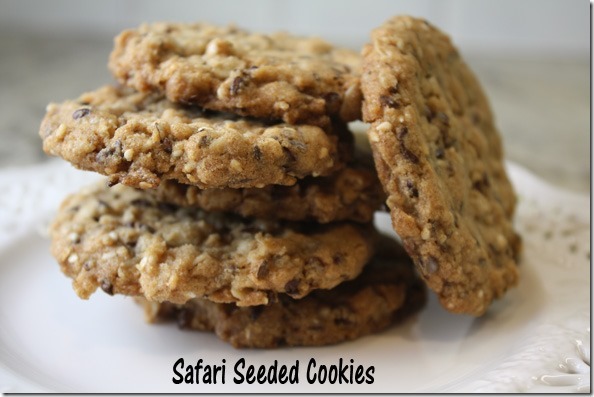 Not to be confused with the previous recipe I gave you for “safari anzac cookies” (the one provided by the African safari camp chef and posted here in November). These are mostly ordinary cookie ingredients, but an altogether different method and a tweak or two. When I made the last iteration of these cookies (I’ve now made 3) I was less than pleased, although all my friends raved about them, and I agreed they were “good” but they weren’t perfect. I suppose if I were the more professional kind of blogger I wouldn’t have even posted the last recipe – since I wasn’t satisfied with them. But I did because everybody loved them, yet I wasn’t sure what in the world I could do with them to make them better or “right” in my book. So, I do what I tend to do best – I researched. I went on the web and looked up things about the CHEMISTRY of cookie baking. The myriad of sites I went to had varying opinions about why one ingredient resulted in this type, or that method made the cookies a different way. But before I even did that, I went to my cookie recipe file (in my MasterCook program) and looked at each and every recipe I have in there (a couple hundred) and examined my photos, and analyzed the ingredients. And as I got down to the R’s in my list I came across my old recipe for Ranger Cookies. They’re a crispy cookie that contains oatmeal and corn flakes and other various things. But I was really looking more at the cookie dough ingredients than anything else – not the add-ins. And I remembered how good those cookies are. Don’t know why I don’t make them more often because I really like them. (6) cake flour tends to give cookies a more cake-like texture – duh, that’s why it’s called cake flour! As am aside, I don’t use Crisco anymore because it’s hydrogenated (medical researchers tell us that’s not such a good thing to eat) so I seek out Spectrum brand non-hydrogenated shortening. It’s carried at some of my local grocery stores, but not all – it’s in a blue and white round plastic tub next to the Crisco. If they carry it. If you can’t find a non-hydrogenated shortening, you can use margarine, but I don’t know how it would work because it’s basically an oil and when it gets warm it melts. The whole idea behind the shortening is that it doesn’t melt easily – except at high temp, higher than the melting (flash) point of butter. SO, keeping all those do’s and don’t’s in mind, I swapped out some of the butter and added the non-hydrogenated shortening. There were no eggs, but liquid was needed, so I added a little swig of milk. I took out the molasses altogether and used a combo of white and brown sugar. I used all-purpose flour and left the leaveners the same. When I started out making these, I had no idea whether they would turn out – I took one thing from one recipe, another from a different recipe, added a couple of things and removed some. And I changed the method of mixing too. I’m not usually as adventuresome about creating cookies because there truly IS a chemistry to baking, but perhaps not as critical as in baking a cake with specific ratios needed. Here’s what I did: first I creamed the softened butter and shortening together and mixed it until there weren’t any streaks of shortening. Then I added the sugars and vanilla. Meanwhile, I’d made a mixture of the flour (all-purpose) and baking powder, soda and salt. Into the cookie batter I added oatmeal and unsweetened coconut and mixed that well enough, then I added in the flour and milk until the batter was pulling together, then I added the seeds (sesame, flax and pumpkin). It looked good. The batter tasted right too. I baked just one sheet of them and let them rest a few minutes after baking to see if they were okay. More than okay! I’ve given away most of these cookies already and can’t wait to make another batch. 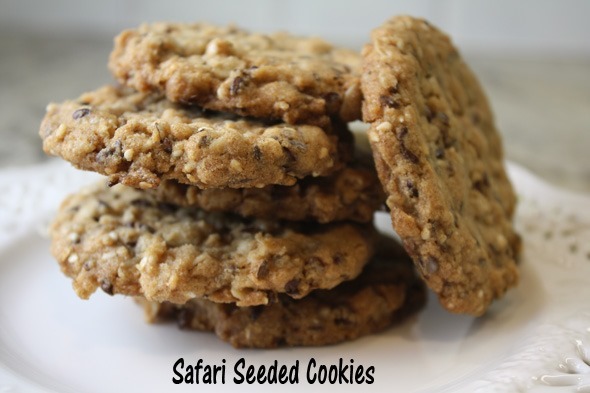 These cookies aren’t exactly like the ones we had on safari (those were much thicker and almost jaw-breakers to bite through) but I’m so happy with the results of my experimentation that I don’t want to try yet again. I’d thought about making yet another (4th) iteration with adding more cookie part and less add-ins, but have concluded these cookies are just perfect. I mean it. They are. What’s GOOD: these are just magnificent cookies, if I do say so myself. Love the seeds. Love the texture and the crispness. Love everything about them. Try them and you’ll see what I mean. What’s NOT: absolutely nothing. These are a winner! NOTES: You can substitute other kinds of seeds for the ones used in this recipe, and you can use more of one than another – just use 1 1/2 cups of a combo of seeds of your choice. You can use regular Baker’s sweetened coconut, but reduce the sugar in the cookie batter by about 1/4 cup. 1. Preheat oven to 350°F. In a bowl combine the flour, soda, baking powder and salt. Stir to combine and set aside. 2. In a stand mixer combine the butter (softened in the microwave for about 10 seconds if the cubes are refrigerator-chilled) and shortening. Mix until both fats are completely combined and no streaks of shortening are visible. Add the brown and white sugars and vanilla and continue mixing until light and fluffy, about 2-3 minutes. 3. Add oatmeal and coconut and continue mixing until combined. 4. Slowly add the flour, along with the milk, until all are mixed into the dough. 5. Add the sesame seeds, flax seeds and pumpkin seeds, and mix just until combined. 6. Scoop heaping tablespoons of the dough onto a Silpat-lined cookie sheet. Slightly flatten tops of each cookie with your fingertips, then bake for about 13-16 minutes, until the cookies are golden and the edges are even darker. (If, by some chance, your cookies spread too much, add in about a tablespoon of flour and mix the dough well.) They can be baked longer so they reach a very dark brown with no real differences except the cookie will be much more crispy. Remove from the oven and set the cookie sheet on a rack to cool for 3-5 minutes, then gently remove cookies from the pan to a rack to cool completely. Continue baking until all cookies are made. Seal in plastic bags and freeze, or they will keep at room temp for about 2 weeks. Per Serving: 139 Calories; 12g Fat (73.0% calories from fat); 2g Protein; 8g Carbohydrate; 2g Dietary Fiber; 16mg Cholesterol; 63mg Sodium. Posted in Cookies, on December 21st, 2015. 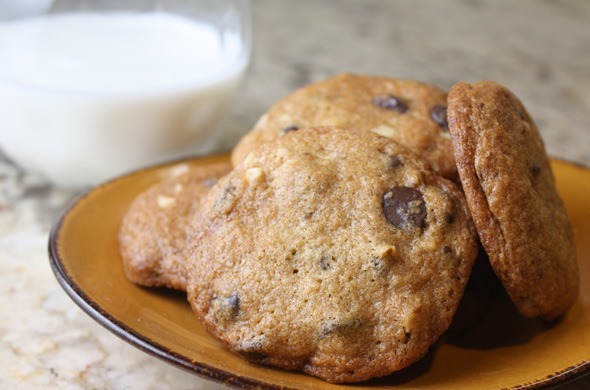 Yes, it IS a different kind of chocolate chip cookie – maybe you wouldn’t know the difference if you’re not a collector of variations of the chocolate chip cookie theme. I was standing in front of the light, so that’s why some look different in the photo. Okay you need to hurry home, read about this chocolate chip cookie and make them immediately. I figure we could have some with coffee by Wednesday if you don’t get distracted. 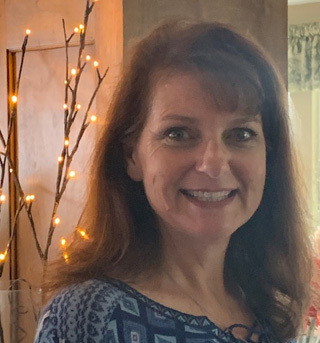 I laughed when I read it – Cherrie almost never says something like that – but you see, she’s not much of a baker. She does bake Christmas cookies, and as I write this (in late November) we have a date scheduled for last week, actually, just before this recipe will post, when we’ll get together in my kitchen and bake up a whole bunch of cookies and divide them between 3 of us, Cherrie, Jackie and me. But Cherrie knows I’m a sucker when it comes to chocolate chip cookies. They are, hands down, my favorite cookie. Period. If you read Food52, you may have already read about this cookie and tried it. If not, then you may want to read about it here. There are several major differences with this cookie – (1) there is no egg in the dough; (2) it uses vegetable oil instead of butter; (3) you absolutely MUST let the dough rest overnight in the refrigerator; (4) it’s vegan, in case you are interested in that aspect. With that in mind, I bought the ingredients while I was up in Placerville, and made them there, leaving most of them for Dana’s family to enjoy. I brought home 3, ate 2 and froze one for Cherrie. She got it last week, and I have forgotten to ask her what she thought of it. It wasn’t by Wednesday – it may have been 10 days later that I saw her, it was near dinnertime, and she surely would not have wanted to eat it then. The cookies look and feel different – because they chill overnight, the dough is kind of hard to work with (I thought) and the cookies stood up – they weren’t flat at all like the cookies shown on Food52’s website. 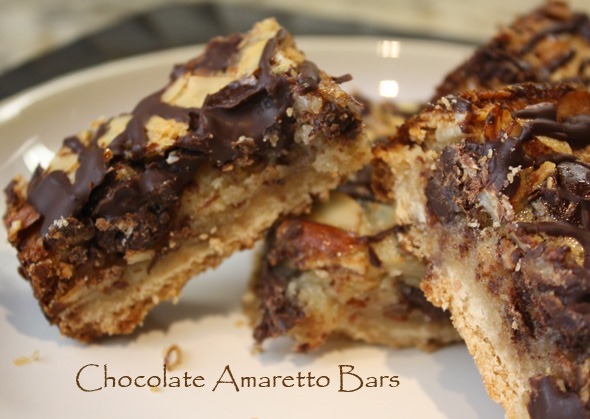 I used dark chocolate chips (which are specified in the recipe), but you could use anything you prefer – use the regular ones, which might be easier to manipulate in the chilled dough since they’re smaller than Ghiradelli’s. The baking part was about the same. The texture of the cookie was not quite as tender as regular ones (using butter and egg). And I thought the dough was less interesting – less flavorful because of the oil. Part of the joy of chocolate chip cookies, to me, is the cookie part, not just the chocolate chips. What’s GOOD: well, they’re different. They’d probably keep longer since they have no egg in them. Most people at Food52 just raved about them. I’m not quite so enamored with them, but perhaps I should give them another try in my own kitchen. And I’d use regular chocolate chips next time. Will these become my go-to recipe? Nope, probably not. You’ll find my favorites listed on my Carolyn’s Favs with three chocolate chip cookies recipes listed as favorites. What’s NOT: only that you must let the dough rest in the refrigerator overnight. For a die-hard chocolate chip cookie lover, that was hard to do! I did taste the dough (which you’d have no health problem doing in this recipe since you won’t be ingesting any raw egg), which seemed about the same as usual. Dough was a bit harder to work with when cold. A cookie scoop would help with that – my daughter didn’t have one, so I used an ice cream scoop instead. 5. Preheat the oven to 350° F. Line two rimmed sheet pans with parchment paper. Remove dough from the refrigerator and use an ice cream scoop or a spoon to portion dough into 2-inch mounds. We recommend freezing the balls of dough for 10 minutes before baking as the cookies will retain their shape better while baking. 6. Sprinkle the balls of dough with coarse-grained sea salt (if freezing, remove balls of dough from the freezer first), and bake for 12 to 13 minutes, or until the edges are just golden. Do not over bake. Let cool completely before serving. Per Serving: 223 Calories; 11g Fat (41.6% calories from fat); 2g Protein; 32g Carbohydrate; 1g Dietary Fiber; 0mg Cholesterol; 136mg Sodium. Posted in Cookies, on December 7th, 2015. A cookie. A little bar. A little square of goodness. Chocolate, cookie crumbs (you’ll have to read below to learn what types), corn flakes (they are the little light colored horizontal striations you see buried in the cubes), nuts, dried cranberries and speculoos. What, you say? I know, you’ll need to read more about that below. When I saw the picture of this little gem on Dorie Greenspan’s website, I just knew I needed to try them. 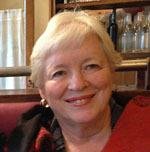 The recipe was written up for her column at the Washington Post. What intrigued me were several things: (1) it was a no-bake cookie; (2) it called for 2 things I knew nothing about – Biscoff cookies (where have I been?) and speculoos (another, where have I been? ); and (3) it was chocolate (yum). First, though, I had to FIND these elusive ingredients. Going down the aisle at my grocery store I found the Biscoff cookies. Because I rarely buy store-bought cookies, I guess I’ve just never noticed. They’re a butter spice cookie, probably made with dark brown sugar, I’d guess. They’re crispy. The manufacturer says they’re “Europe’s Favorite Cookie with Coffee.” Not remembering how much I needed, I ended up buying 2 packages. I only needed one. But, if I hadn’t found the other elusive ingredient I would have used the 2nd package to make the cookie butter. 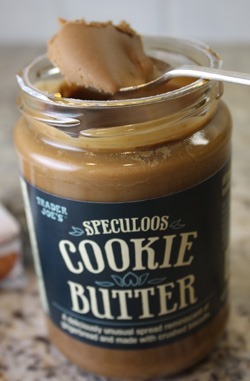 In the write-up, Dorie mentioned that Trader Joe’s makes a speculoos cookie butter which is very similar to the Biscoff cookie, in a butter form, and sure enough, they do. Right next to their version of Nutella. In a jar (see photo) and I scooped a spoonful of it up for you to see – it has the same look and texture as peanut butter. It’s jarred, and it says right on it, don’t refrigerate it. Okay, got it. I used most of the jar for the filling of this cookie. Don’t know what I’ll ever use the rest of it for – maybe over the holidays someone will want to spread it on toast. Being me, I had to go look up more about speculoos – from wikipedia: Speculoos is a type of spiced shortcrust biscuit, traditionally baked for consumption on or just before St Nicholas’ feast in the Netherlands, Belgium, and around Christmas in the western and southern parts of Germany (and they make it into a spread, just like Biscoff does). In my pantry I had corn flakes. I also had ample dried cranberries, and I chose to use almonds in this – you can use any kind of nut you’d like, or use a combination. The recipe calls for just 1/2 cup of nuts. First you make the cookie base. I whizzed up nearly all of one cookie package in the food processor until it was fine crumbs. Melted butter was added, then it was patted into the 9×9 pan – actually it might be an 8×8 pan, which is what Dorie calls for. I do suggest you press the cookie crumb layer firmly – if you don’t it will fall apart when you try to cut it into cubes later. That is put into the freezer to firm up while you make the filling. 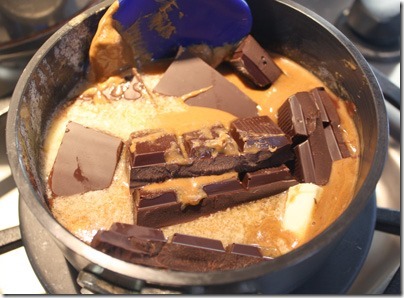 In a big saucepan you melt butter, the speculoos cookie spread/butter and 12 ounces of chocolate. Dorie prefers a dark chocolate, which is what I used. Milk chocolate can be substituted, though. I used a flame-tamer to do that part because the mixture was very thick (the speculoos particularly – it’s sticky like peanut butter) and I didn’t want it to burn. I let it cool a bit, then added the corn flakes, dried cranberries and almonds. You can also use raisins, dried cherries or chopped up dried apricots instead of the cranberries. You stir all this together until you can’t see any more of the cornflake pieces, then gently scoop it on top of the frozen crumb crust. Press it down firmly all over (I didn’t do that quite enough) so the chocolate layer adheres to the crumbs. The mixture is spread out clear to the corners and you do squish it out and down as best you can. Chill several hours, or freeze. I can’t imagine trying to cut this from a frozen state. Getting this block of stuff out of the pan was a bit of challenge – I dipped the 8×8 pan into a pan of hot water for about a minute (being careful to not splash any water into the cookies), then used a narrow metal spatula to free all the edges. It came out easily at that point (Dorie actually recommends blowing a hair dryer all around the bottom and sides of the pan); I righted it, then cut it into cubes. Dorie recommended 7 sliced strips – I was only able to get 6 from my pan, then I carefully cut each of the long slices into cubes, so I got about 40. A serrated knife did not work for this (though Dorie suggests it). I found a big chef’s knife worked better. And as it was, I messed up a bunch of them where the crumb crust came unstuck. I’ve packaged them up in a plastic box and they’re in the refrigerator. Before serving, allow them to warm at room temp for about 15 minutes, Dorie suggests. My cubes were not very uniform – Dorie’s look like they’re cut with precision. It’s a bit hard to do – but that won’t matter to the taste of them. What’s GOOD: love the flavor of these – the cookies give a different flavor and texture – the crunch in them is wonderful. I liked the corn flakes. 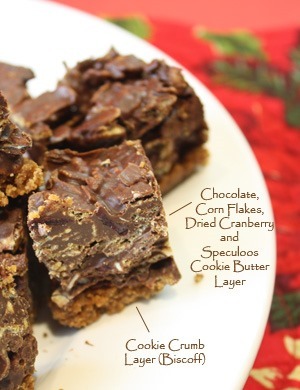 All of it is good, and although it’s a no-bake cookie, you’ll still spend a bit of time making this. But it’s not like rolling out Christmas cookies, using a cookie cutter, then baking. I would think children would LOVE these. Haven’t tried them on any yet, but I will. 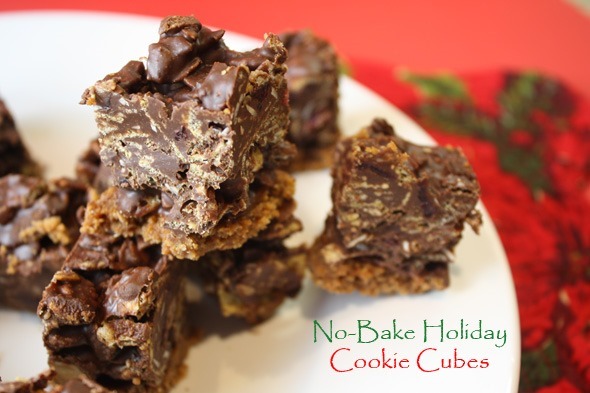 What’s NOT: nothing other than some time – saying it’s a no-bake cookie just means you don’t have to heat the oven. You’ll still spend a bit of time making them. 1. CRUST: Pulse cookies until fine crumbs, then place in a medium bowl, pour over the melted butter, and, using a fork or your fingertips, mix until the crumbs are moist and evenly coated. Turn out into the 8-inch square pan, then use your fingertips to press and compact the crumbs into a crust. Freeze the crust while you make the topping. 2. TOPPING: Put the butter in a LARGE heavy-bottomed saucepan (such as a 3-to-4-quart pan), then add the cookie spread; finally, add the chocolate and salt (use the lesser amount if you’ll be adding salted nuts) to the pan. Cook over low heat, stirring as the ingredients melt, to form a smooth, glossy mixture. Turn off the heat and stir in the cornflakes, dried fruit and nuts, mixing until all the add-ins are coated with the chocolate mixture. 3. Remove the crust from the freezer; pour the topping over it and use a spatula to spread the topping across the crust, making sure to get it into the corners. Press firmly so the filling sticks to the bottom crust. 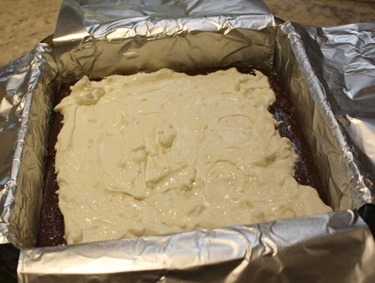 Refrigerate for 4 hours; you want it to be solid. 4. To unmold, either warm the bottom and sides of the pan with hot air from a hair dryer (Dorie Greenspan’s preferred method) or dip the pan into hot water for about a minute, taking care not to let the water splash onto the chocolate. 5. Place a piece of parchment or wax paper over a rack or cutting board, and have another cutting board at hand. Run a round-edged table knife around the sides of the pan, and turn the pan over onto the paper. If the cookie slab doesn’t drop out of the pan, apply more heat. Once the slab is unmolded, carefully flip it over onto the other cutting board so the crust side is down. 6. It’s easiest to cut the slab into cubes using a long chef’s knife or a serrated slicing knife and a sawing motion. Cut cookie cubes that are roughly 1 inch square by slicing the slab into 7 rows and then cutting each row crosswise into 7 cookies. Store the cubes in the refrigerator or freezer, and allow them to sit at room temperature for about 15 minutes before serving. 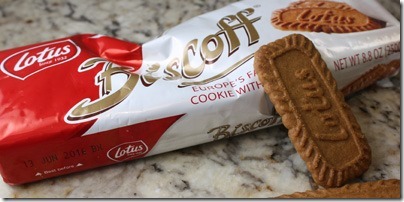 Biscoff’s are available at most grocery stores. Speculoos butter is available at Trader Joe’s. It resembles peanut butter. Per Serving (not accurate as I forgot to add nutrition info on the speculoos): 111 Calories; 7g Fat (54.9% calories from fat); 1g Protein; 12g Carbohydrate; 1g Dietary Fiber; 8mg Cholesterol; 58mg Sodium.